“[T]he Palestinian leadership actually demands a Palestinian state with one pre-condition: No Jews. 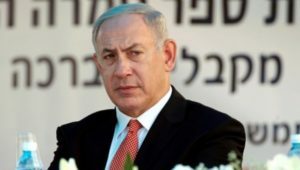 There’s a phrase for that: It’s called ethnic cleansing,” Netanyahu said in a video earlier this week which was released in Hebrew and English, as well as in a version with Arabic subtitles. Ahmed Majdalani, an adviser to Palestinian Authority chairman Mahmoud Abbas, dismissed Netanyahu’s remarks as “lies”.